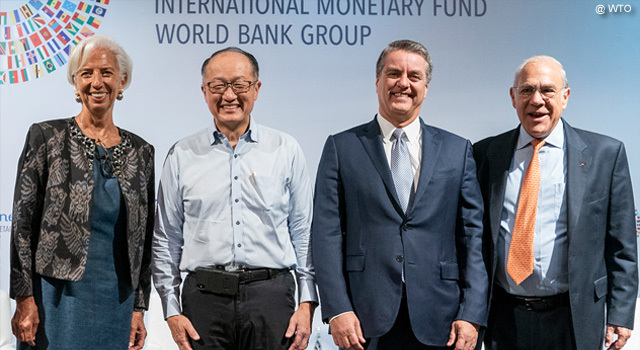 Heads of the World Trade Organization (WTO), the International Monetary Fund, the World Bank, and the Organisation for Economic Co-operation and Development issued calls to bring a new focus on trade and the multilateral trading system to drive growth around the world. The organizations issued a call to ease trade tensions and noted the role that trade has played in reducing poverty. In this speech given in Bali, Indonesia, on 10 October 2018, WTO Director-General Roberto Azevêdo discusses the need to cooperate on trade issues to promote growth for all. This speech appears on the WTO website. Ladies and gentlemen, good morning. It's a pleasure to be here – and to be joining forces with Christine, Jim and Angel for this important conference, at this crucial moment in global trade. Today's event is intended to reinforce some economic fundamentals – specifically the importance of trade for growth. It seems that we have a disconnect here. New polling presented at the WTO last week shows that most people believe trade is positive. In advanced economies, on average, 88% of people said 'trade is good.' In emerging economies it was 83%. Even in the US it was 74%. But despite this broad and instinctive support for trade in principle, it seems that people still doubt its specific benefits for them. This raises a range of issues for domestic policy. But it also raises questions about how we see trade and its role in the economy. For example, very few people believe that trade lowers prices. Yet most economists would say that this is among the clearest benefits that trade delivers. This is important because if we start to doubt these fundamentals of why trade matters, then gradually we will stop valuing and safeguarding the mechanisms that make trade possible in the way we know it today. And of course one such mechanism is the multilateral trading system. Now, let me be clear, the trading system is not perfect – but it represents the best efforts of governments around the world, working together for 70 years, to find ways to cooperate on trade issues. It took a lot of people and a lot of time to push the boulder this far up the hill. Even keeping it in place requires constant effort. Today the WTO covers around 98% of global trade. It is has overseen a historic opening of markets and integration of economies. Since 1980 average tariffs have been cut by two thirds. The system has provided stability and predictability in global trade – holding firm even during the financial crisis. And, as a result, it has helped to fuel unprecedented growth and development around the world, as well as a dramatic reduction in poverty. The system has real value. So we have to keep working at it. We should acknowledge that progress in delivering new trade reforms has been slow in recent years. In fact, between the creation of the WTO in 1995 and 2013 when we met right here in Bali there were virtually no new reforms at all. With that meeting we began to change that story. And a number of other steps – on food security and in support of LDCs for example. This is very positive. But it is not enough. Progress in many key areas has been stalled for some years. And in the meantime the world hasn’t stopped. New economic priorities have emerged. Technology is transforming how we produce and how we trade. Geopolitics continue to evolve. All of this has given rise to a new debate about how to make the WTO more effective. This debate has taken off in recent months. Many leaders have committed to working together on this reform agenda. And in this context it is vital that everyone who believes in the system raises their voice. We all have a role to play here – and that includes the private sector. I very much welcome the new 'Global Dialogue on Trade,' which the ICC [International Chamber of Commerce] is launching here in Bali later today. We have to explore all avenues which could ease the current tensions and strengthen the trading system. We all know the risks of further escalation – risks to the economy and risks to the trading system itself, which would multiply the economic risks over the long term. We need trade and the trading system to play their part in fuelling growth – just as they have done so effectively for seven decades. So I look forward to our debate today – and to your support in this effort.